Apple executives announced Tuesday the arrival of the 13-inch MacBook Pro with a Retina display to join the 15-inch edition announced in June, bringing the popular thinner design and Retina display to its MacBook Pro line of laptops. The new computer is 20 percent thinner than the previous version, and weighs one pound less than the 13-inch edition, coming in at 0.75 inches and 3.57 pounds. 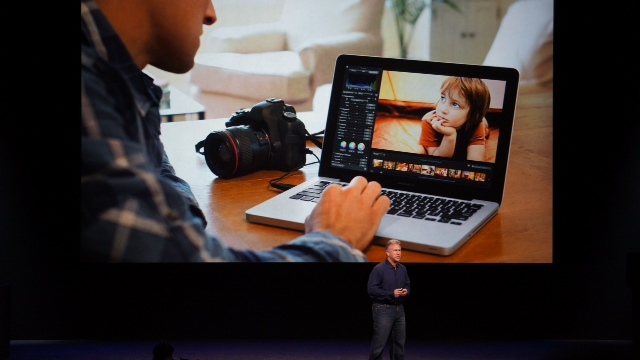 The new MacBook Pro has 4.96 million pixels, and will ship beginning Tuesday starting at $1699 with 128GB flash, 8GB RAM, 2.5 Ghz dual-core i5 processor. This makes the 13-inch about $500 less than the 15-inch, which was started at $2,199 to start for the base model. The company says it will have 75 percent less reflection and 28 percent higher contrast than the current generation. “Searching the web can be like a fine print magazine,” he said.